The day after a holiday weekend is never a good time to deal with anything challenging, so today, I thought we would ease into the work week with a Paris home that requires little effort to appreciate. 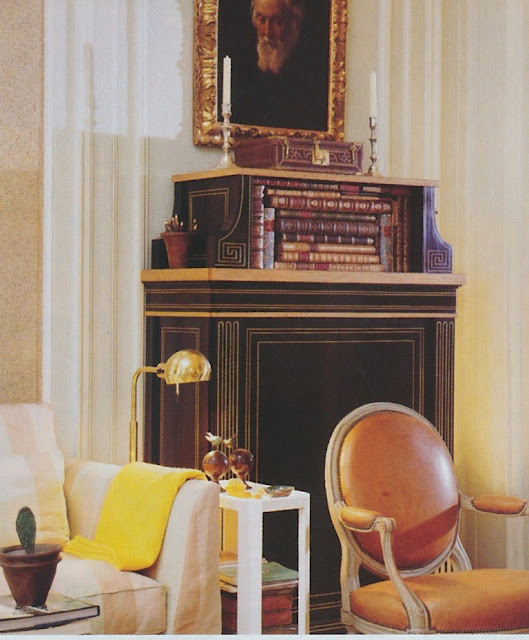 The apartment you see here, which was built around 1790 and is located on the place du Palais-Bourbon, belonged (and, perhaps, still belongs) to Didier and Barbara Wirth. Through the years, the homes of the Wirths have been published frequently, including their noted house in Normandy, Chateau de Brécy. 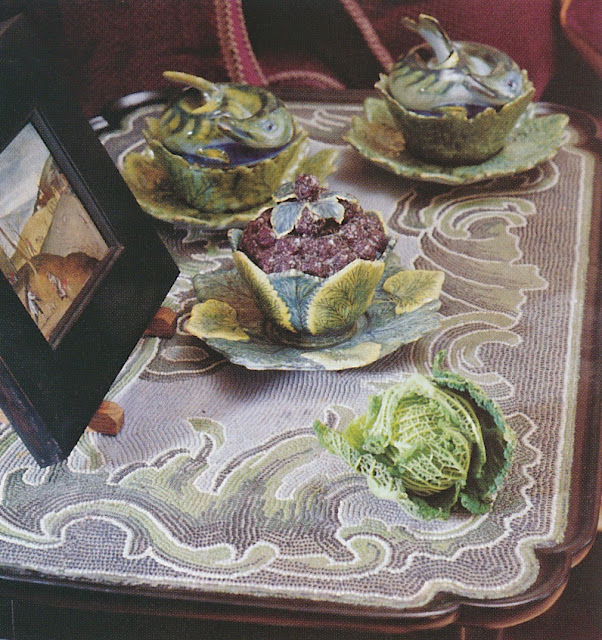 Barbara Wirth also authored one of my very favorite books on table settings, The Elegant Table , so perhaps it's not surprising that I very much admire her sense of style. In fact, if you were to search my blog archives, you would find a number of Wirth-related posts. 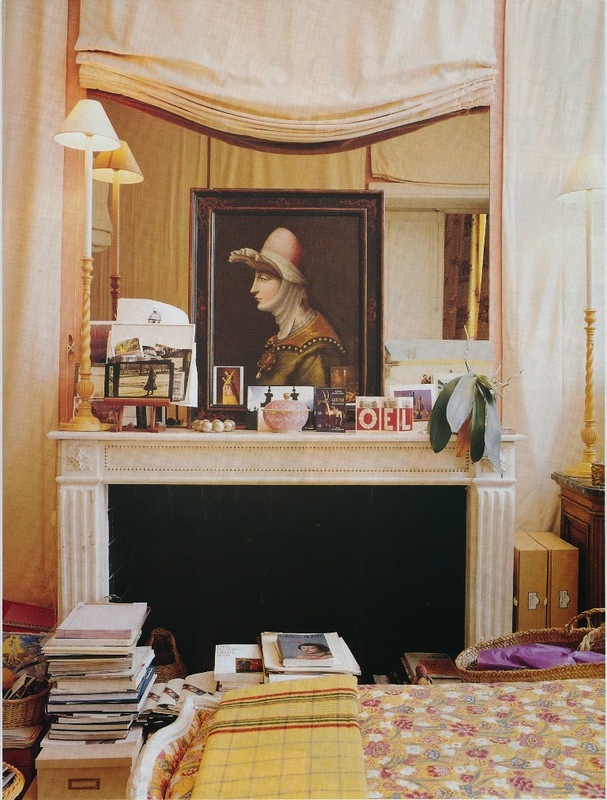 When it came to decorating her Paris apartment, Barbara Wirth worked with her frequent design collaborator, Christian Badin, who also happens to be her cousin. 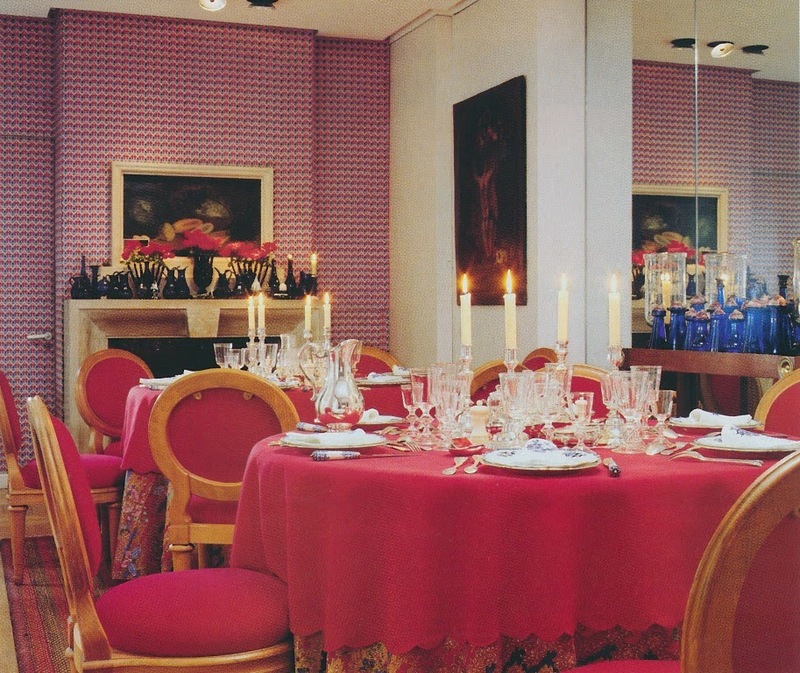 (Both cousins were associated with David Hicks' Paris design shop.) Wirth has an obvious penchant for beautiful things, and yet, there is nothing remotely precious about this apartment. 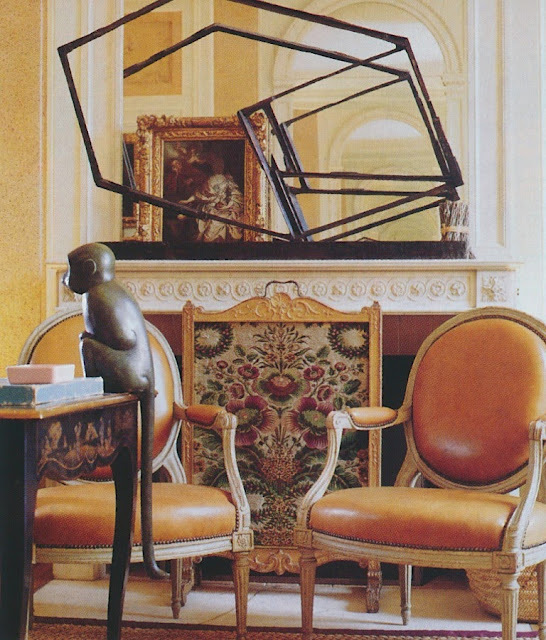 Here, dressy furnishings are tempered by the unobtrusive, like rush matting and casual furniture arrangements. 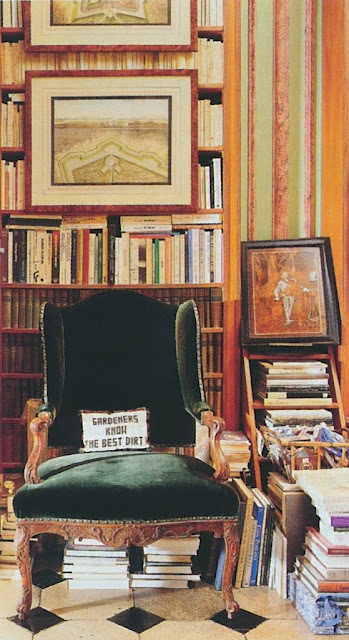 It's the home's easy sensibility that I find so appealing, although I suspect that the sight of the Wirths' inviting library might have influenced me as well. 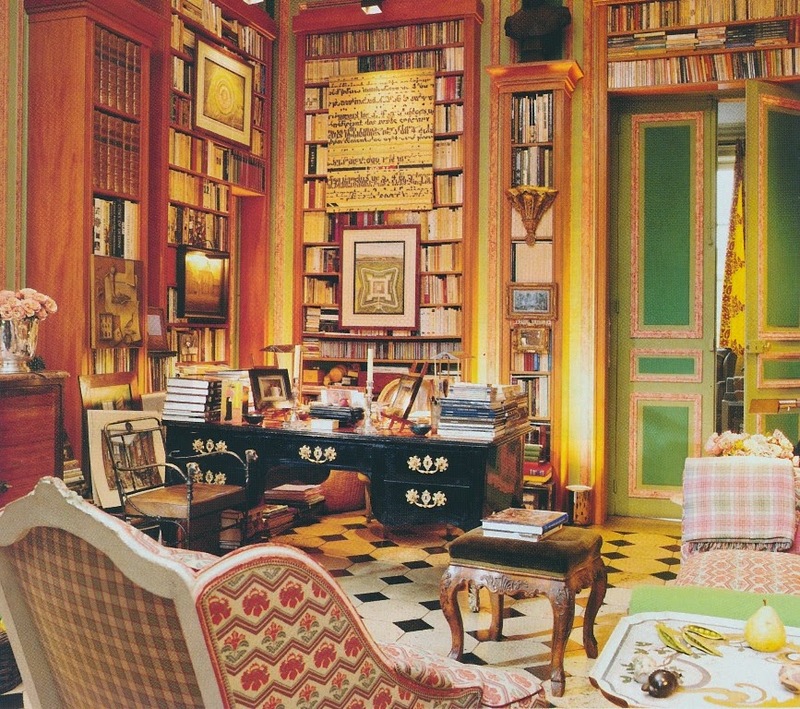 I could easily have spent my Memorial Day weekend in just such a room. 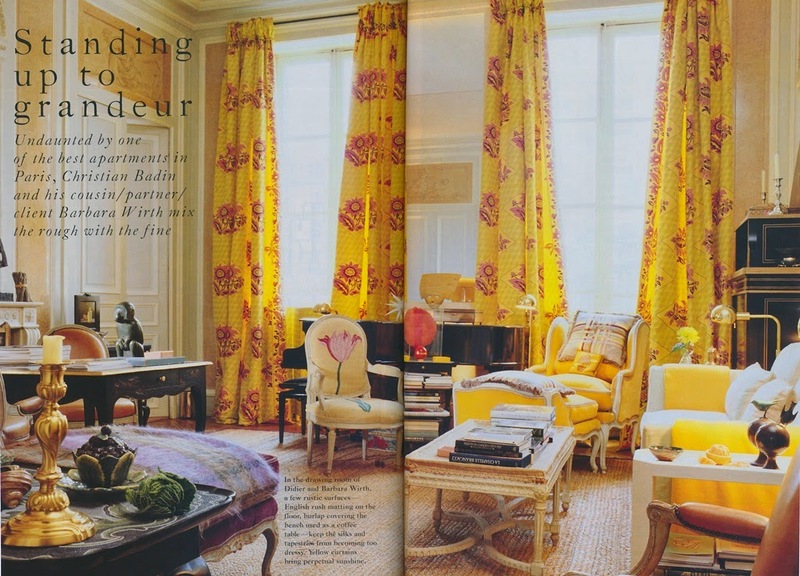 The sunny drawing room was made sunnier by yellow curtains, upholstery, and throws. The entrance hall evoked the outdoors thanks to those wooden cypress trees and Wirth's collection of watering cans. 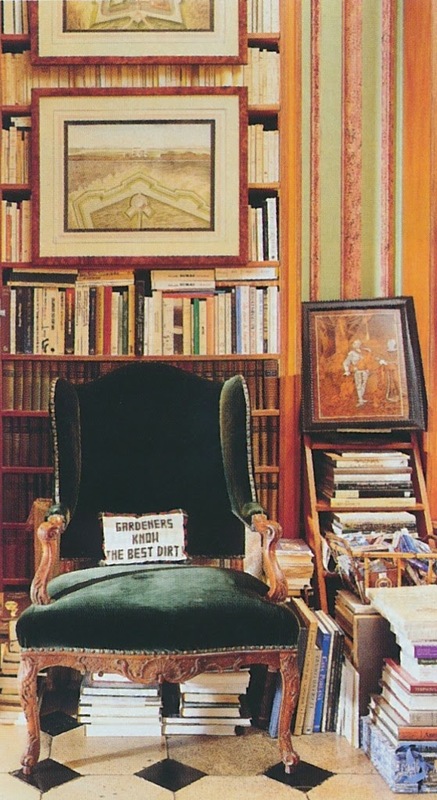 The library, which was filled with books, objects, and comfortable furniture. Wirth switched out her dining room's décor seasonally. 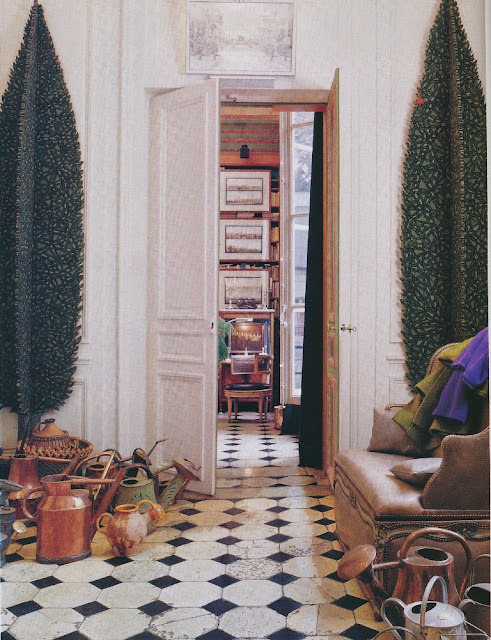 In the spring and summer, the cool tile walls were left visible, while during winter and fall, they were covered by panels wrapped in a David Hicks fabric. 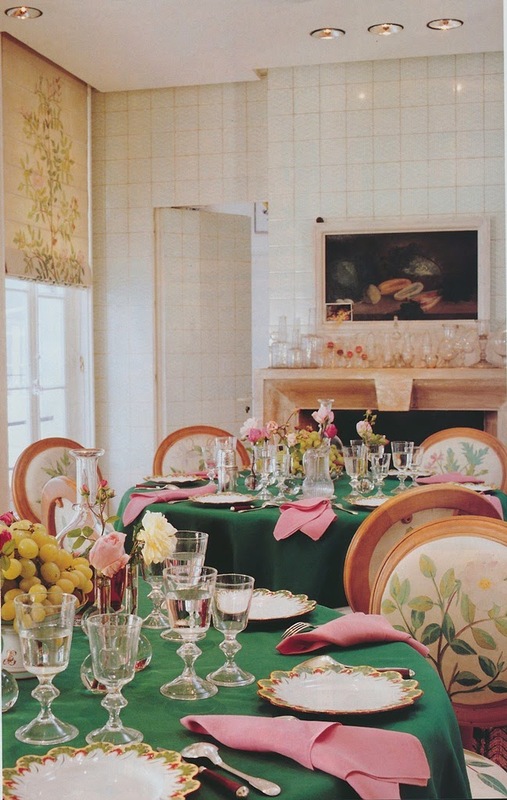 The dining chairs, designed by Badin, had seats and backs that could be changed out according to seasons. A number of years ago, Veranda featured a more recent version of this dining room. 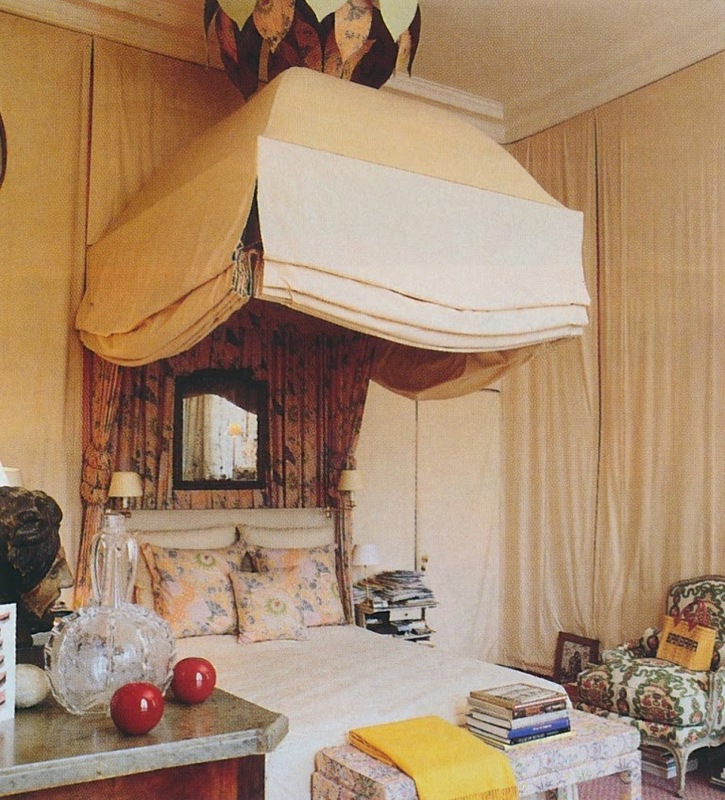 The Wirths' bedroom had a lit à baldaquin, which was designed by Badin, while roman shades covered the room's walls. 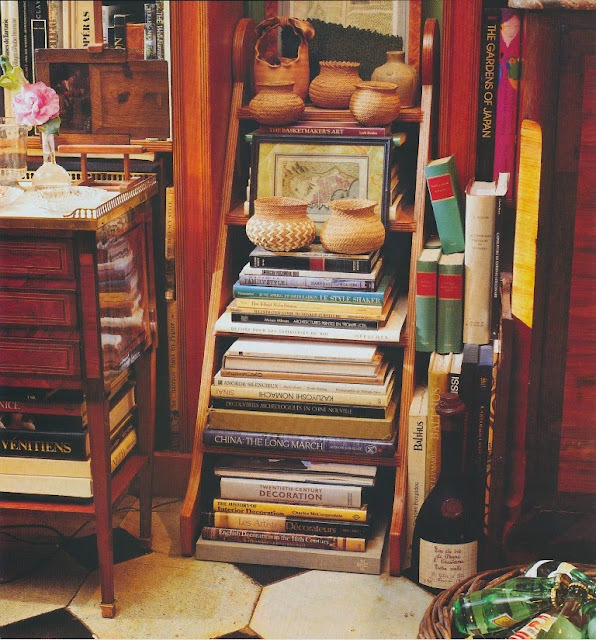 All photos from House Beautiful, January 1995, Antoine Bootz photographer. Jennifer you have brightened my day with this glorious home. The use of yellow is done in such an elegant way, the throw, the curtain panels, the entire design so inviting and comfortable. Love the library! 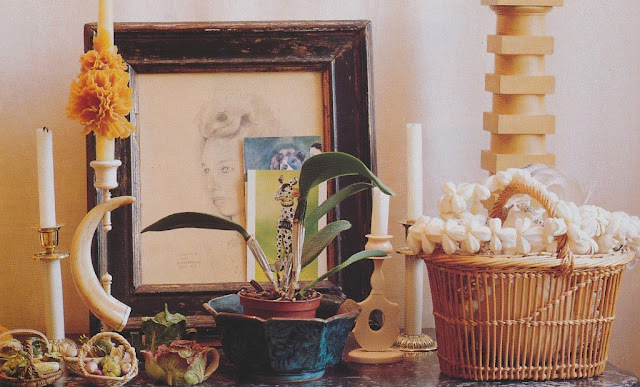 That illuminated yellow reminds me of Albert and the little cottage he had here, where he used a D D Tillet cotton in the same chrome yellow, with pale grey floors and white walls, DIVINE! Thanks for sharing these beautiful images, Jennifer! That library instantly filled me with joy! It has a sort of Beauty and the Beast vibe to it that I adore. I really liked the yellow curtains. Thanks for sharing these so loving images.